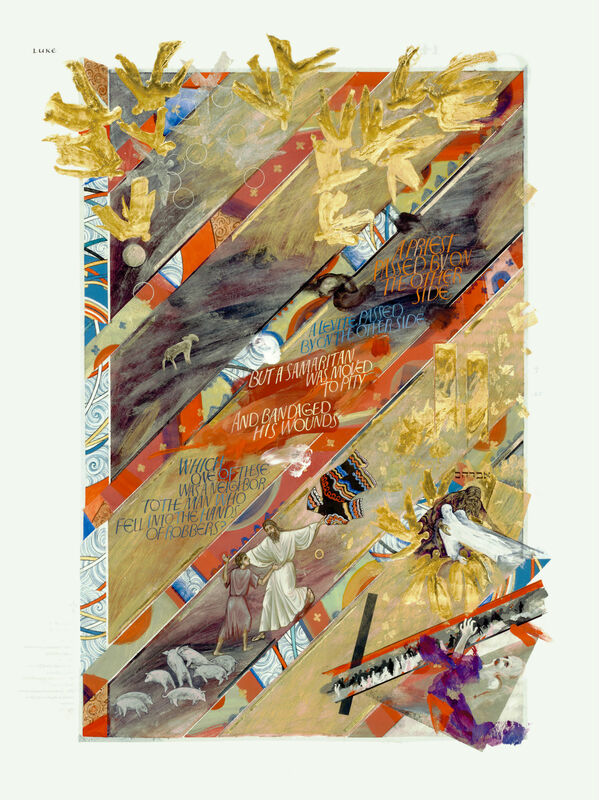 Woman Taken in Adultery, Aidan Hart with contributions from Donald Jackson and Sally Mae Joseph, Copyright 2002, The Saint John’s Bible, Saint John’s University, Collegeville, Minnesota USA. Used by permission. All rights reserved. Jesus says, “Neither do I condemn you. Go your way and from now on do not sin again” (John 8:11). The Gospel recounts that he said it, as in it is written in the past tense, but I cannot stop myself from reading it in the present tense: “Jesus says…” During this season of Lent, we are more aware of our sins. We are called to repent and believe in the Gospel. We are especially aware of our weaknesses. When we come to this passage in John’s Gospel, we hear Jesus encountering our sin. Jesus does not brush it aside. At the same time, he does not seek the punishment we or others might put on ourselves. He shows mercy. This unexpected act commands our attention, and the solidarity it shows can move us. The only one without sin was the one left alone with the woman, Jesus. We all sin, and there are times when we find motivation to fulfill the punishment we see fit, be it on ourselves or on others. But instead of punishing the woman, Jesus puts her on the same plane as the scribes and Pharisees and reveals God’s mercy. Chris Morgan is in his second year of studies for the Master of Divinity degree at Saint John’s School of Theology and Seminary. He grew up in Denver, Colorado, and graduated from Saint John’s University in 2011. His ministry interests include hospital chaplaincy, ministry in the outdoors and work with people with disabilities. I hear a narrative in which Jesus moves from the Mount of Olives to the temple in order to teach. A crowd immediately gathers to listen to what he has to say. Not just some people, the text says that all the people came. Then the scribes and Pharisees brought a woman in front of him to test him. They cite Moses and the law and ask Jesus to make a judgment regarding her. He takes a moment before he responds, but when they press him, he neither condemns her nor undercuts the law. This is a story of mercy. This is a story that points to our role in carrying out judgment on earth. There is no doubt this event made a big impact on the woman. She rightly expected to be stoned that day. She was not, and that makes all the difference. Expecting to die, Jesus gave her new life. What word stands out to you? When I look at this illumination, I immediately notice that it has two frames. The first one is a bit darker, and the second one points me back to the first frame when I see the stones on the ground. 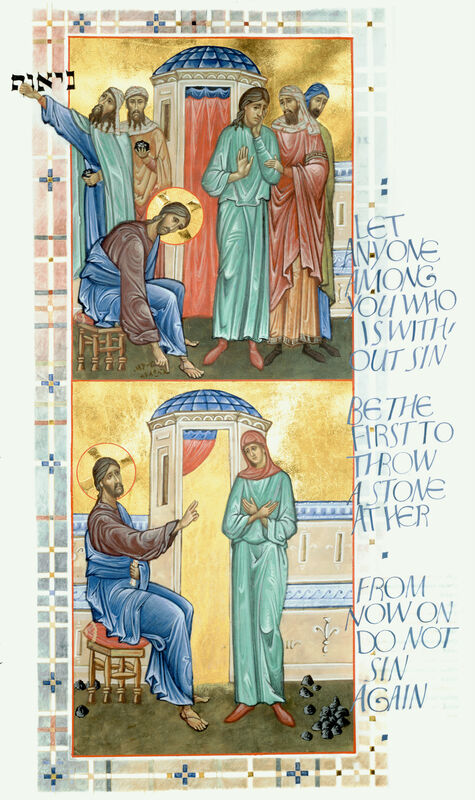 As I look back and forth, I see Jesus in a humble position in the first frame and I see the curtain open to the woman in the second one. When I see Jesus bent down in the first frame, it communicates the difficulty of the situation. How will he respond? I’m drawn to the second frame because it seems that there is peace and confidence in Jesus’ decision. I see the open curtain in two ways. The first signifies that Jesus is pointing the way out of the temple, instructing the woman to go back to her life with the mission to sin no more. The second shows Jesus pointing her into the temple where she can be closer to God. She may want to offer a sacrifice to God after such an event. Whereas before she was separated from God, this act of mercy gives her the chance to be in deeper relationship with God. My sins are exposed before you. And I know pure justice would leave me dead. Even before you speak, I heap shame upon myself. I even seek my own punishment and carry it out. But you, O God, you show me mercy. You touch me in my inmost being. You speak truth in my heart. You remind me that you are there with me. And inspire within me self compassion. Despite my resistance, even to this, you persist. Have mercy on me, God, in your kindness. Teach me the wisdom of self compassion. This is the music I make to you while I live! all the days of my life. As I contemplate this story, I feel a certain solidarity with all people. When the scribes and Pharisees dropped their stones and walked away, they told me that they had also sinned. It reminds me that we are all struggling. Each one of us has a challenge to bear, and I feel support remembering that. Imagining the many ways in which I might observe the sins of others, this story gives me a real sense that everyone from the highest scholars, gurus and religious leaders all the way down to the people labeled as the biggest sinners need the mercy of God. All are one in our need for relationship with God and in our need for God’s mercy. It moves me to be more merciful daily because opportunities to give mercy abound. What observations remind you of the opportunities to give and receive mercy? When I hear that the accusers went away, one by one, beginning with the elders, I encounter the wisdom of mercy. I see the accusers deferring to the wisdom of Jesus. When I ask God to teach me wisdom, it is dangerous because it may require me to refrain from my typical pattern of punishing others or myself. It is dangerous because I am praying for an experience to gain wisdom, which will surely challenge me to grow and change. This work of transformation is painful. Christ’s way that we follow, being extensions of Christ’s mercy, is not just a feel-good story of positive self talk. The implications are huge. How do we respond to people we think have broken the law—to people who have divorced and remarried, to people who have abused children, to people with addictions? Like this woman in the story, these people might expect to be “stoned” for their actions. It is no simple decision, but Jesus, as he does on several accounts in the Gospels, imagines a creative and inspiring third way forward. What is the third way you need to find? When all you see is either letting yourself and others “off the hook” or punishment according to the law, how will this story stimulate your imagination? The structures that upheld the law then still exist to uphold the law now. The structures are reinforced within us and within the wider Christian community. This passage calls us to pause for a moment, to listen to God’s voice of mercy, and to act from God’s wisdom in our inmost being. Luke Anthology, Donald Jackson with contributions from Aidan Hart and Sally Mae Joseph, Copyright 2002, The Saint John’s Bible, Saint John’s University, Collegeville, Minnesota USA. Used by permission. All rights reserved. Jesus summons us to be open: open-minded, open to ourselves, open to daily renewal, open to others, open to transformation, and open to love. In Luke 15:1-3, we see that Jesus tells the parable of the lost son as a way to expand the minds of the Pharisees and scribes, who started to grumble about Jesus’ association with sinners. In doing so, Christ reveals the tender nature of God, who extends a generous welcome to all. Like Jesus, we are called to proclaim this message of good news with joy to the entire world: God’s love is free and available to all! The hope-filled promise of eternal life, which overcame suffering and death on the cross through Jesus Christ, becomes real and transformative in our lives when we love without conditions. Chet Jechura holds a Master’s of Theological Studies degree from Boston College and works in faith-based political consulting. He lives in Washington, DC. It is often hard to accept another person’s generosity toward us. It is also often hard for us to see someone, besides ourselves, be the recipient of another person’s generosity, when we ourselves did not benefit from that act of kindness. Jealousy and pride go hand in hand. Engrained in our American spirit of rugged individualism is this idea that fierce independence is a measure of strength. But when we value not needing anyone’s help, we also resist when others are helped. This is a vicious cycle that Jesus beckons us out of by offering us the parable of the prodigal son. It is not about taking advantage of generosity by plundering everything we have been given like the younger brother because we know a bail out is on the horizon. Nor is it about striving for perfection in everything we do such that we become haughty like the older brother. Instead, this is a story about the magnificence of God’s love, which lies at the heart of the miracle of our personal, daily resurrections and social transformations. This story calls us, like the two brothers, to contemplate continuous conversion in the face of God’s magnanimous love. O God, our world needs more love, mercy, and compassion. Soften our hearts, renew our minds, open our eyes, and allow us to be transformed by the workings of your grace. Free us from the compulsion of jealousy, help us to value the goodness in others, teach us the way of prudence, and lead us along the path of humility. Thank you for always being there for us. Your unearned, unconditional love is always there ready and waiting to be received. Lasting joy is union with you. Amen. 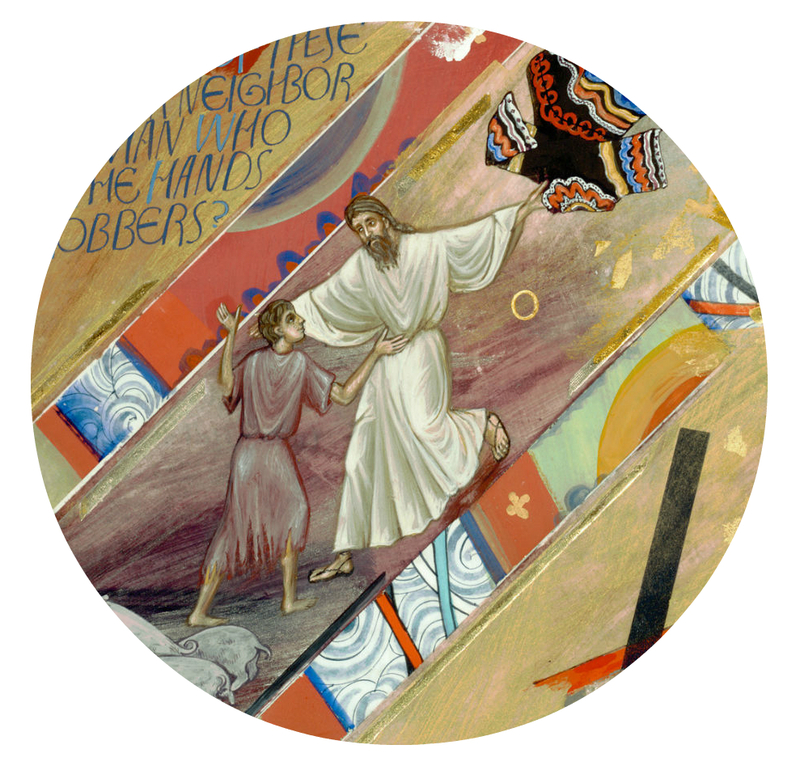 In the same diagonal panel in which we see the image of the father reaching out to embrace the son, we also see two gold bars—the Twin Towers. Suddenly, we realize that we cannot divorce our modern reality from this Gospel message. In this illumination, we are confronted with the truth that following Christ does not only mean we are daughters and sons of the abundantly merciful Father. It also means that we are called to do the difficult work of forgiveness. We are called to interpersonal, intergenerational, interracial, and intercommunal forgiveness. It is not easy to be like the father in the parable. And certainly not every situation calls us to express our regard for others with a physical welcome and embrace. Some relationships cannot be reconciled because they are too abusive and exploitative. But forgiveness is still essential and it is work we can do with God’s grace. These difficult scenarios call for a different kind of openness—one of our hearts rather than our arms. With open hearts we let the offenses of these relationships go, loosening their control in our lives. Rather than keeping our bitterness, resentments, and anger locked away in hearts, we implore that the Holy Spirit guide us to release them appropriately. In doing so, we experience more freedom. By the grace of God, we are then able to live more fully the life to which God calls us in a healthy, safe, and meaningful way. It is no mistake that this parable is read during Lent. Like many of the stories we see depicted in this illumination, this is a story about resurrection and renewal, about death and coming back to life. The younger brother thinks he has it all, but when he loses all that he has, he is humbled. What is more humbling than being willing to eat the food that pigs eat and yet not being offered any? To be sure, he is also embarrassed and ashamed at the thought of having to share the news with his father that he lost his inheritance and is now incapable of supporting himself as an adult. But he goes back to his father anyway, because that is all he knows to do. He begs for his father’s mercy. He pleads for compassion. And what awaits him is an unexpected, surprising celebration. Like the father, God is always waiting for us, ready and willing to accept us with open arms. No matter how badly or how often we fall, no matter how much of our talents we waste, no matter the extent to which the life we seek leaves us hungry and unsatisfied, God is always ready to rejoice with us when we return. Like the father, who tells the servants to quickly bring out the best robe for the youngest son, God promises to clothe us with God’s grace. We can easily relate to the two brothers in this story. We understand the impatience of the younger brother who asks for his father’s inheritance upfront, his giving into temptation, his inability to be a good steward of his resources, and the shortsightedness that ultimately leads to his demise. The life he has chosen for himself, which may have seemed a dream come true to him at first, leaves him quite literally hungry and unsatisfied. Then there is the older brother, who is responsible, practices an exceptional work ethic, follows the rules, and respects his father. Yet, because of this, he develops a complex that causes him to think he is better than others, at least better than his younger brother. He finds it unfathomable that his father would celebrate the return of his younger brother, who squandered his inheritance, when he has been so diligent and responsible all along. Indeed, there are moments when we can see and hear ourselves in the very human and real laments and frustrations that both these brothers give a voice to in this parable. How do you find yourself reacting to and identifying with each brother?